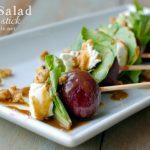 Beet Salad on a Stick! 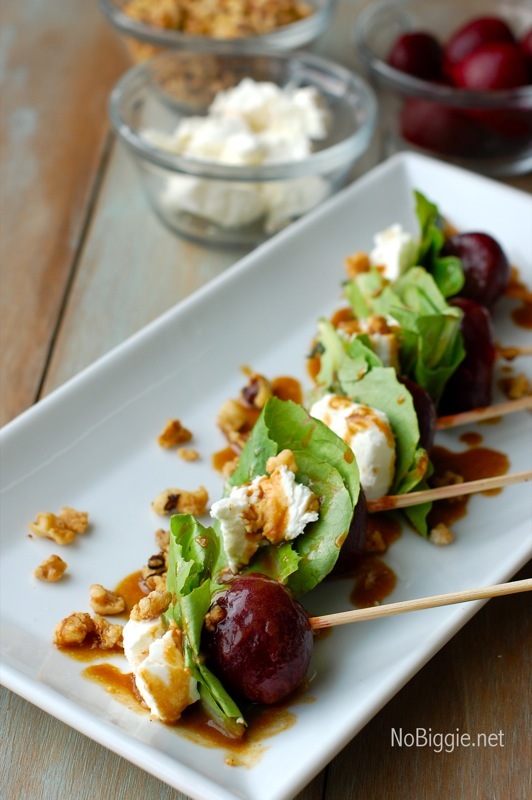 Serve up a Beet Salad in a fun way with this Beet Salad on a Stick! Whenever we eat out and the restaurant serves a beet salad on the menu, chances are I will always order it. I love a good beet salad…good beet salads with goat cheese and candied walnuts or pecans are the best! If you’re looking for a simple appetizer to bring to a holiday party this time of year, this is it! It’s super easy to make, it’s healthy and it’s looks gourmet! It will be a hit at your next party, I promise. Serve up a classic beet salad in a fun way...on a stick! To start candy the walnuts: in a dry saucepan add the chopped walnuts into the pan at high heat, constantly stirring (do not walk away during this time). Once you start to smell the walnuts as you stir, add the 2 tablespoons of sugar. Continue to stir as the sugar begins to melt and cover the walnuts. Once the walnuts are all coated, remove from heat and let cool. Take the 1/4 can of frozen orange juice concentrate and combine with the balsamic vinegar. Stir together until the orange juice dissolves. Add in the oil. Move the dressing mixture into a sauce pan over medium high heat and let it reduce down to make the dressing more thick. Once you reach a good consistency, remove from heat and let cool. Now it's time to plate: Skewer the beet first then the lettuce followed by the goat cheese. Add the goat cheese last, as the goat cheese tends to crumble a bit. 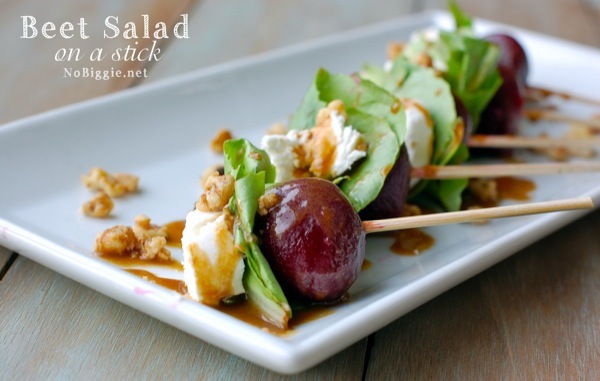 Once all skewered on the plate, drizzle the dressing over all the skewers and sprinkle with the candied walnuts. Serve chilled. Each bite should have all of the above for an explosion of flavor! Yum! It’s so good! I hope you make them! I think I might have to make this tonight! I love a good Beet Salad!